Amniotic fluid embolism (AFE) is a recognised, yet rare cause of maternal collapse. It is often a fatal complication of pregnancy and the puerperium, and is a direct cause of maternal death. The most up to date UK data states that there is an incidence of 2/100,000 pregnancies. The cause of this phenomenon is still under debate however possible roles have been attributed to strong uterine contractions, excessive amniotic fluid and disruption of vessels supplying the uterus. It therefore remains a condition that is neither predictable nor preventable, with no established accurate premortem diagnostic test or investigation. As there is currently no consensus on a pathophysiological process, the risk factors for amniotic fluid embolism are based mostly on abnormalities of the amniotic fluid, uterus and placenta themselves. 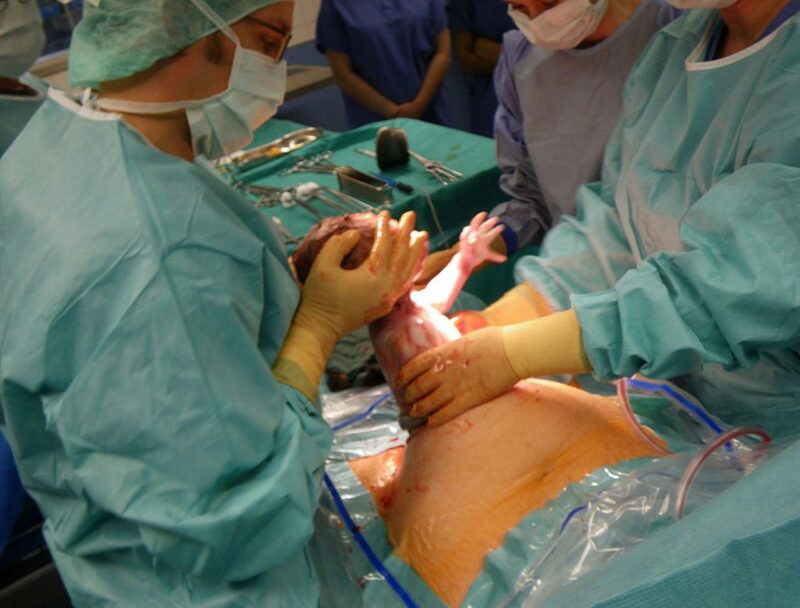 Fig 1 – Caesarean section is a risk factor for amniotic fluid embolism. The physiology related to amniotic fluid embolism has been described as similar to anaphylaxis or severe sepsis. As such, the manifestations of this complication of pregnancy resemble these disease processes. The differential diagnosis will include other conditions that present in this way – such as pulmonary embolism, anaphylaxis, sepsis, eclampsia and myocardial infarction. It is therefore difficult to confirm the diagnosis and the focus should therefore revolve around resuscitation and stabilisation of the patient. The mainstay of management in amniotic fluid embolism is resuscitation. Investigations are similar to those undertaken during cardiac arrest and other emergency scenarios. Some may not be possible. Early involvement of the multidisciplinary team is important. If this condition is suspected, anaesthetics must be involved to arrange intensive care admission. All of this coordination should occur whilst rapid maternal resuscitation is administered. Basic ABCDE approach must not be forgotten, with high flow oxygen essential to minimise neurological compromise and fluids given as appropriate in order to counteract hypotension and haemodynamic instability. Anaesthetics will be involved with measuring pulmonary artery wedge pressures and they will be able to take blood to assist with the diagnosis (shows fetal elements in the aspirate). Disseminated intravascular coagulation should be managed with the involvement of haematologists. If the baby is not yet delivered and the patient is relatively stable, continuous fetal monitoring should be instigated with a view to imminent delivery. However should cardiac arrest or severe maternal compromise occur, perimortem section is indicated to facilitate CPR of the mother. Definitive diagnosis of amniotic fluid embolism is only definitively confirmed on post mortem and demonstrates fetal squamous cells along with debris in the pulmonary vasculature. 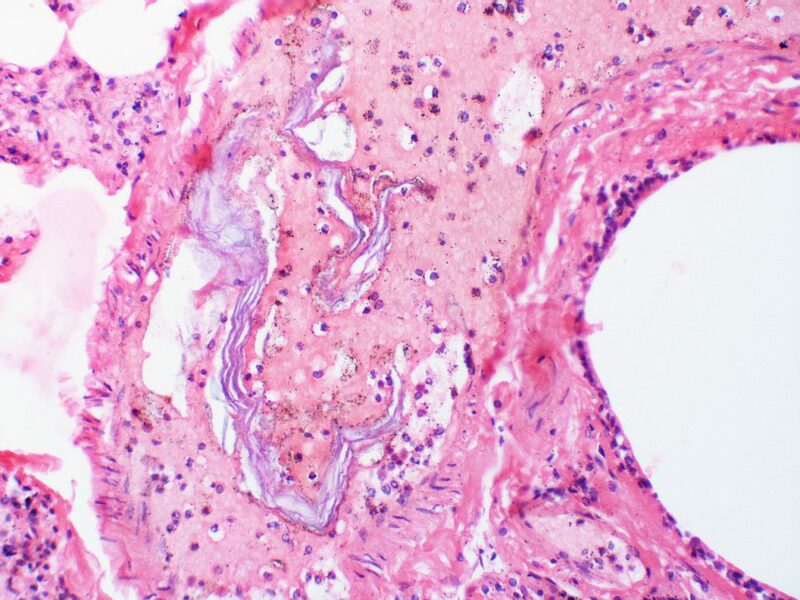 Fig 2 – Amniotic fluid embolism, with intravascular squamous cells present. Amniotic fluid embolism is a rare yet often fatal complication of pregnancy and the puerperium. Little is known of the pathophysiology yet it resembles anaphylaxis/severe sepsis in presentation. Risk factors relate to abnormalities of the placenta, uterus and amniotic fluid. The focus of management is resuscitation of the mother by any means necessary and it is important to involve all members of the multidisciplinary team. Diagnosis can only be made definitively at post mortem examination.